Saks Fifth Avenue has been providing New Yorkers with quality clothing and services since 1924. Located across the street from Rockefeller Center, Saks Fifth Avenue attracts plenty of tourists, especially on the ground floor. At Christmas time they create such elaborate windows, there is a line just to see them. You can also stand across the street and see the entire front of the building light up to music. Hours: Monday through Saturday, 10 a.m. to 8:30 p.m.; Sunday, 11 a.m. to 7 p.m.
Two prominent merchant families in New York City at the turn of the 19th century combined their retail operations to create the city's first specialty store dedicated to fashionable living. Horace Saks and Bernard Gimble opened Saks Fifth Avenue on September 15, 1924. Adam Gimble, a cousin of Bernard's, took over as president after Horace died suddenly just a couple of years after opening the flagship store. 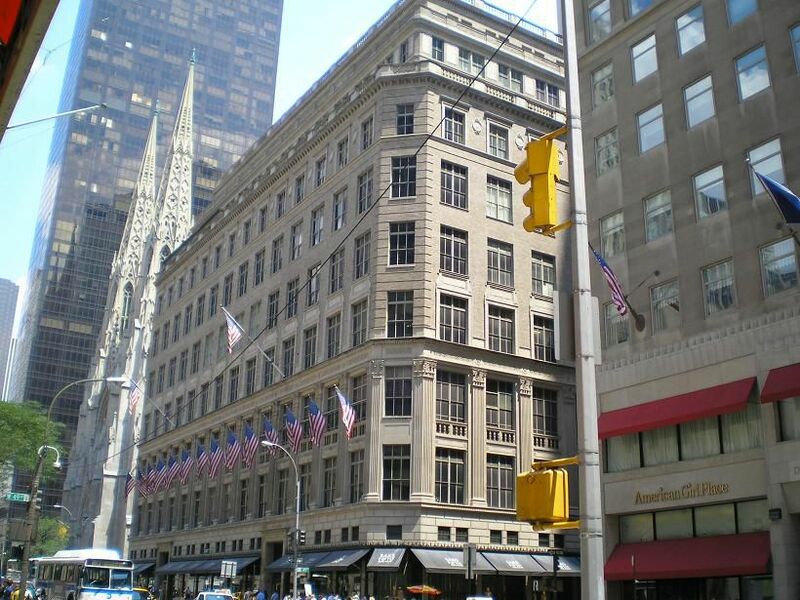 The young Gimble, just 32 years old at the time, took Saks Fifth Avenue from coast to coast and continued to build the luxury brand until his retirement in 1969. Ownership of Saks Fifth Avenue changed several times during the next few decades. Each group of fresh leadership pursued new initiatives that launched a factory outlet brand called Off 5th, took the company public, and launched an online store at saks.com. In 2013, Hudson's Bay Company, North America's longest continually operated company, acquired Saks Incorporated. The iconic brand continues to dominate the luxury lifestyles market. Rotating pop-up stores from specialty retailers. Cafe SFA on the eighth floor serves brunch, lunch, and afternoon tea. Simple yet well-executed cafe fare includes soups, salads, and sandwiches, served with impressive views of Rockefeller Center and St. Patrick's Cathedral. Brides-to-be can make an appointment to choose a designer gown for their big day. With a robust selection of bridal shoes and lingerie, plus attire for the entire wedding party, including all of the appropriate accessories right down to the cuff links and wedding rings, Saks Fifth Avenue covers the details. Known for its luxury in-store boutiques displaying lines from top American and European designers, Saks Fifth Avenue also carries mainstream labels from designers such as Diane von Furstenberg, Tory Burch, Marc Jacobs, and Tommy Hilfiger. Women through size 24 can find something that fits in the Plus and Extended Size department, while parents can get everything they need to outfit their children from birth through the teenage years. The men's department carries everything from casual weekend wear to coats to golf attire and office staples. A true department store that lives up to the classic description, Saks Fifth Avenue stocks everything from fur to furnishings, accessories to art, and gifts to gourmet foods. The home department carries upscale kitchen brands such as Le Creuset and Vitamix, and luxurious bedding from Kate Spade, Burberry, and Ralph Lauren, among other deluxe brands. Take a break from your shopping at this Swedish, gourmet coffee bar located on the sixth floor. Even the smell of the coffee alone will give you the energy to shop until you drop.